Stems: Erect, unbranched or branched in lower portion, hairy. Leaves: Opposite, stiff, spreading, sessile, linear to linear-elliptic, 1/4 to 4/5 inch long, less than 1/10 inch wide, upper surface glabrous, lower surface pubescent to glabrous; margins entire, usually fringed with hairs; tips blunt or pointed. Inflorescences: Clusters, congested, 1-12-flowered, in leaf axils; bracts at bases of flower-stalks very narrow and long-tapering. Flowers: Two forms; open at pollination and closed and self-pollinating; open flowers small; calyx tubular, hairy, strongly 13-ribbed, base swollen, upper teeth spreading, lower teeth only slightly curved upward; corolla blue or whitish, about 1/4 inch long, finely pubescent outside, glabrous inside, weakly 2-lipped; upper lip erect, tip notched; lower lip spreading, 3-lobed; stamens 2, under upper corolla lip; closed flowers barely longer than calyx. Fruits: Nutlets, 4, narrowly egg-shaped, yellowish-brown, smooth, each 1-seeded. 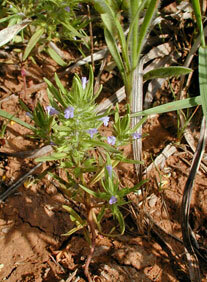 Habitat: Dry, exposed prairie and pasture sites, roadsides, and waste areas; often on sandy or rocky soils. Distribution: All but the southwest corner of Kansas. Uses: The Dakota took a tea made made from the leaves to treat colds and used the plant to enhance flavors for individuals who were ill.